The 2015 SEC Men’s Basketball Tournament is scheduled to get started on Wednesday, March 11th, 2015 in Nashville, Tennessee. The tournament will be held at Bridgestone Arena and will go through Sunday, March 15th, 2015. We have included a free, printable bracket for you to use when following SEC game play for this year’s tournament. The overall winner of the tourney earns an automatic bid to the 2015 NCAA Men’s Basketball Tournament Championship. All teams will be trying to knock off overall #1 Tournament seed, Kentucky, who finished the regular season at 31-0 and running the table in conference play. 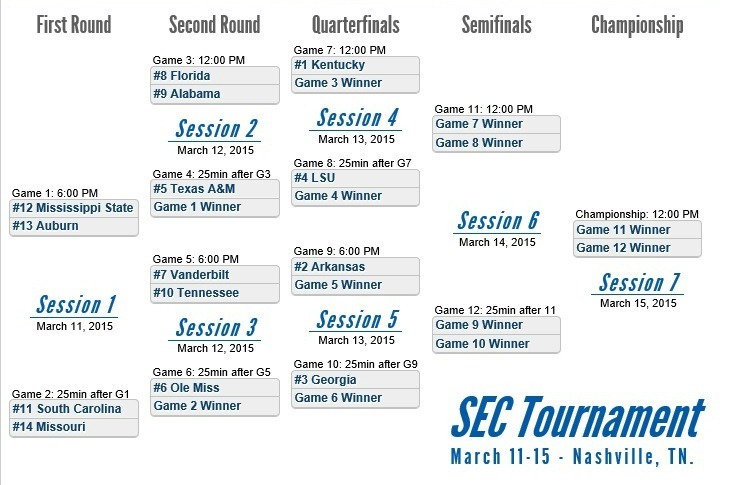 The 2015 SEC Men’s Basketball Tournament Bracket is now published. We have posted a free, printable version of the SEC Bracket for you to use here. Also, you can enjoy our 2015 NCAA Men’s Basketball Tournament Bracket posted here.